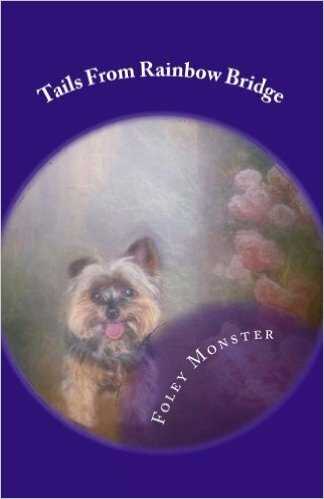 I have received permission, because my readers are the most loving pet parents in the world, and, it has been noted, by some very important souls here at the Bridge, that many of them are grieving a lost pet, to let them know that a new way has been discovered for them to see their angels after they go to the Bridge. All parents have to do to see their angels is to activate their imaginary eye. Humans are born with an imaginary eye. When they are infants and toddlers, they use it frequently. They can see invisible friends, unicorns, and anything else they can create. Young children are regularly telling their parents not to sit in a spot because their friend is there. Their parents humor them because their imaginary eye has been extinguished. This process begins when children go to school. That is where students are introduced to facts. During this process, they learn the difference between fact and fiction. Fact is real. Fiction is not. The imaginary eye, which the body uses to create fiction, begins to be diminished. The downside of an imaginary eye is that no one else can see what you see, even if their imaginary eye is fully activated. Your imaginary eye only sees what you imagine, and no two humans can imagine the same thing at once. The imaginary eye stays strong in single children, or those who are lonely, but slowly, as they grow older, they let the adult voices tell them that imaginary things are for little kids, and humans lose their valuable sixth sense: Imagination. But I am writing this to get you to reactivate this valuable tool. What you have to do will seem simple, but is quite hard. You are going to have to believe: Believe that you can see things, like a beloved pup, sleeping on your sofa, or striding next to you, when no one else can. To do this, you are going to have to tap into your faith. That is what makes you believe things that can’t possibly be true are real. If you can find your faith, you can activate your belief system and see it all. The trained part of your mind is going to keep telling you that it is silly and childish. Ignore it. When you are ready to close your eyes and picture your angel, then open your eyes and look around, to a piece of furniture, or the floor, or a car seat, wherever you want, and then picture your angel there. When you do that we will appear, looking up at you. I bet our tails are going to be going a mile a minute. I know, there are downsides to the imaginary eye. If the loss of your pup is still fresh seeing them with your imaginary eye can be a painful reminder, since none of the other senses, smell, hearing, touch, or taste, are activated by the eye. But, if you can master your imaginary eye, you will be able to see your baby again. Speaking for the angels, I can assure you that we are hoping you can use your imaginary eye, so we can see you looking at us with a heart full of love. We would love to see it again. Let yourself believe, open your eyes, and see us. Then let our love wash over you. And don’t let anyone tell you we are not there. They are just blind to the possibilities of imagination and should be pitied. Hopefully, you will see us soon. My ghostwriter's imaginary eye is always on. There have been lots of great big puffy end-of-summer clouds that are full of angels lately. Eye think that is most wonderful! I was an only child, and I think my imaginary eye is still fairly strong. I will use it to see my Lexi. Thank you for the reminder. On a side note, isn't it wonderful how the very elderly and those who are preparing to pass regain their imaginary eye? What a lovely thoughtful post!! I recently lost Purrince Siddhartha Henry my Buudhist Burmese cat....I have tried to see him so much & your post reminded me of the 3rd eye as I know it. I will practice this so I can see all my beloved cats once again.